Republicans need to pick up six seats in November to gain control of the Senate. Consensus to date points to good prospects of this happening. But one state where the picture remains unclear for Republicans is North Carolina. 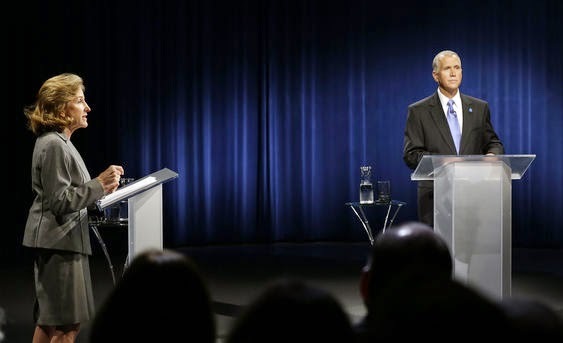 Republican challenger, speaker of the North Carolina House of Representatives Thom Tillis, has failed to pull ahead of Democrat incumbent Senator Kay Hagan and average of latest polling shows him behind 3 to 4 points. Mitt Romney won North Carolina in 2012 by three points. In the last ten presidential elections, Republicans prevailed in North Carolina eight times. North Carolina is anything but a boilerplate blue state. And the Hagan-Tillis face-off is as pure liberal vs. conservative as you can get. Tillis is an experienced legislator and solid conservative. One issue is the volatile black vote. Not volatile as to their consistency to vote for Democrats but whether or not they show up to vote. North Carolina, with a population that is 22 percent black, is a laboratory this November for whether the Republican challenger can successfully point to the dismal record of the Democrat incumbent regarding black progress and convince black voters that they should not vote for more of the same. The big question in states like North Carolina, and with black voters nationwide, is how long will blacks continue to buy what they have been sold for years by liberals. Hagan’s story line for black voters is the same as what liberals always tell blacks. But will these voters really believe that the black poverty rate in North Carolina stands at 34 percent, versus 13 percent among whites, because taxes are not high enough or because government spending is not expansive enough? Or that the graduation rate of black males in North Carolina is, according to the Schott Foundation, just 58 percent, because government is not spending enough on public schools? Maybe blacks will finally grasp that government spending really benefits the political class and not the lower class. Median income in North Carolina in 2013 was $45,906 compared to $90,149 in the national capitol Washington, DC-Arlington-Alexandria region. The political class in Washington and the mainstream media can complain that outside money is being spent in North Carolina. But the fact is that because of the aggressive growth of government, all Senate races are national. So yes, the National Rifle Association is getting its message out in North Carolina about the importance of 2nd amendment protection. While crime ravages most black communities, only 13 percent of blacks, compared to 26 percent of whites, own guns. And yes, the Susan B Anthony List is getting its message out in North Carolina about the abortion extremism of liberals like Hagan. While black women account for only 7 percent of the nation’s women of childbearing age, they account for 35 percent of the abortions and Planned Parenthood, the nation’s largest abortion provider, with 79 percent of its clinics targeting black communities, has pledged $3 million to support Kay Hagan. And yes, black conservatives are in black communities in North Carolina pointing out that big government means slow economic growth, and this hurts blacks. The black unemployment rate in North Carolina is more than double that of whites. Black voters sent Kay Hagan to the U.S. Senate in 2008. Maybe as blacks start taking a closer look at Hagan, and other liberals, they will start having second thoughts.